Over Thanksgiving weekend in the small Quebec Township of Three Pines, the body of a beloved resident is found lying amongst the leaves in the forest. Chief Inspector Armand Gamache of the Sûreté du Québec is called in to investigate what appears to be a murder. Can this picturesque town and close-knit community survive a rigorous investigation? A year after losing my chance to meet Louise Penny at Bouchercon, I finally decided to dive into her acclaimed Inspector Gamache mystery series. I’m not going to lie; I initially had some reservations about it. I wasn’t worried about the quality, mind you; I just assumed it would be too soft and cozy for my liking. Thankfully, I was wrong. 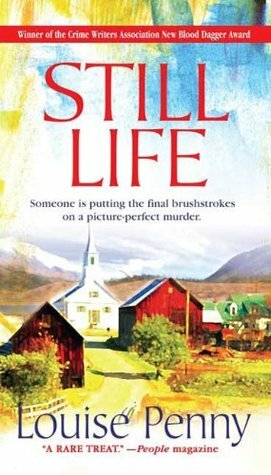 Still Life has enough death, backstabbing and deceit to shake a stick at. Gamache, although a tad dry, is a solid choice to build around. Penny surrounds Gamache and his crew with a plethora of peculiar players that make up the village in which the murder takes place; a smart move considering Penny has now penned fourteen novels set in Three Pines – can’t have things getting dull now, can we? For a first novel, Still Life is pretty damn impressive. I thought the mystery was well-crafted and the twist designed to uncover the culprit was quite clever, so it isn’t exactly a shock that Penny ended up with oodles of awards for this one. Penny’s sense of humor and her prose are very entertaining – I guess spending your prior career as a journalist can lead to a successful career as a novelist when it comes to writing interesting and funny dialogue. I have high hopes for the series moving forward as recurring novels set in a small town can only get better as the characterization deepens – at least, I’m hoping so. Judging by her following at Bouchercon last year, her popularity is remarkable. I can only imagine how much she’s grown as a writer since this one, so I’m looking forward to reading on.